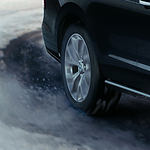 Make an effort to avoid driving your vehicle through deep snow. In colder temperatures, that snow will become impacted into the undercarriage, and will not melt for days or weeks. The salt in the snow begins to rust and corrode moving parts, resulting in mechanical issues that can escalate the longer the snow stays under the vehicle. In order to reduce the chances of the salt doing damage to the exterior or undercarriage of your vehicle. get it to a good car wash at least once a week. The high-pressure water system at the car wash will quickly and easily remove most of the salt and help to maintain your investment for years to come.